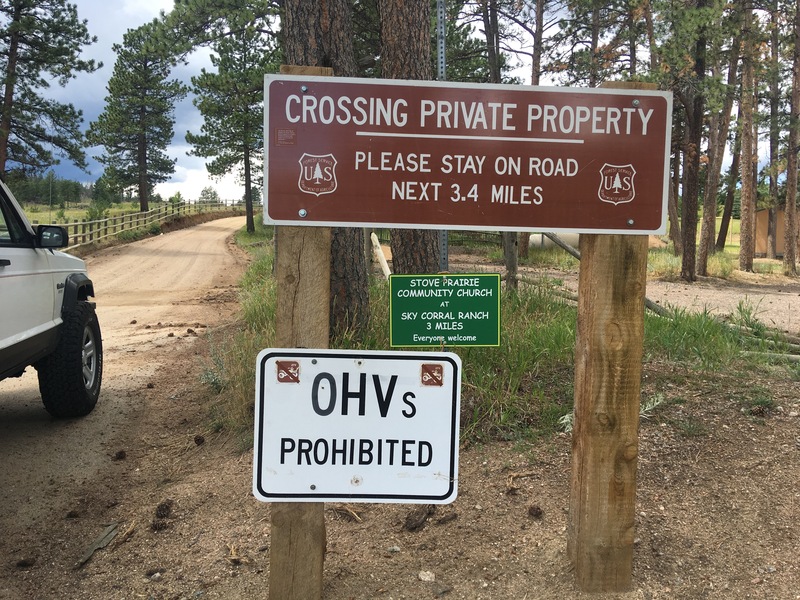 OTodaTodToday, Old Flowers Road is simply another forest access road, and alternate (offroad) route from Stove Prairie & Rist Canyon to Pingree Park. Old Flowers Road actually consists of two parts, East Old Flowers, between Stove Prairie and Pingree Park, and West Old Flowers, from Pingree to the the trailhead for Flowers Trail, a hiking trail. The area which Old Flowers Road runs through suffered greatly from the High Park fire, which in its extent consumed over 136 square miles, taking a place as the second-largest wildfire in recorded Colorado history. The High Park fire had a brief stint as the third most destructive fire in terms of buildings destroyed, at least 259, before being surpassed by the Waldo Canyon fire a week later. E. Old Flowers starts, however, as part of an intersection with Stove Prairie Rd. & Rist Canyon Rd. At this intersection is the historic Stove Prairie schoolhouse, built in 1896 and still operating to this day as part of the Poudre School District. The schoolhouse is the oldest operating school in Colorado. Heading west from the intersection on Old Flowers, you are immediately greeted with signs letting you know that you’re about to cross private property, first through Stove Prairie Ranch. Very good road for the first three or so miles. Taxpayers live back here, of course. Stove Prairie Ranch was established in 1896, along with the school and a homestead. Its timber and cattle production became industry-recognized because of the ranch’s unique brand. Faded etchings of the original brand can still be found of the property. The ranch underwent change in ownership in 1990, who then turned the property into a world-class horse breeding facility, and a destination for event hosting, including weddings and corporate retreats. More at their official website (not affiliated with BackwoodsWanderers.com). The rest of the road through Stove Prairie Ranch is overall good, and receives regular maintenance. Old Flowers Rd. continues for another two miles through more private property and houses before turning into a forest road. This sign signals the transistion out of private property and on to public lands. Even though the green sign says to make a right for Old Flowers Rd, you can’t even go right unless you have a key to the gate. Here, you want to head left on FR 152 to stay on the actual road. The quality of the road immediately changes once you’ve passed through the first section of private property. There is another section of the road through private property, but it isn’t for a while. Within the first few miles of being on the forest road, there are several creek crossings, which are rarely deep. They can be deeper in the runoff season or if it rains heavily. Since you are heading uphill towards a burn area when you’re following the drainage, you are at risk for flash floods so be cognizant of the weather. You aren’t directly in the drainage the whole way up, a lot of times you’re actually uphill from it. But there are several times you are in it, either crossing a creek or running parallel to it. E. Old Flowers is mostly a good road, and has seen lots of improvement since the burn. It is predominantly two-track and a good road bed. There are sections which sustained extensive damage from the fire and washouts, some of which have been improved, some of which are in fair shape at best. Either way, these few sections give the road its upper-end rating, and if wet these sections also pose the greatest risk to less-equipped vehicles and greatest chance of getting stuck. I found that a particularly bad section had been improved since I previously did the road a year ago. It used to be a technical section with large rocks that you need to find a line through, that was often muddy, and the creek actually drained through. It had been filled in with earth and graded over, with drainage channels cut on both sides. That said, not long after passing that improved section, we ran into a guy whose truck had slid into a ditch from the slippery mud and I ended up pulling him out, as well as my buddy who slipped in as well since his 4wd went out. So be careful out there! Never travel alone unless you have the equipment for a self recovery. The fella who was stuck was just taking his wife and kid on a weekend cruise and if we hadn’t come along…well let’s just say he was very stuck. A good section of road through a meadow. There are tons of nice camp spots, most of which I’m apprehensive about discussing specifics because I want to keep them to myself. One nice spot, however, is directly to the left of where the picture above was taken. It’s a pull-off with a fire pit right next to some trees. The rule of thumb if you’re trying to track down dispersed camping sites is look for pull-off spots and already-built campfire pits. This cabin was lost in the High Park fire. Inside it is evident it was inhabited up until it was destroyed, with linoleum floors, and remnants of furniture. From the meadow the road takes a sharp turn to the north (or right turn heading westbound), and passes by a cabin which was destroyed by the fire. You can go inside, but do so cautiously because of broken pieces of wood, scraps, and nails. From here, the road meanders through some woods, gets narrower, goes through a creek crossing or two, and then starts climbing uphill to get over into Pingree Valley, with the road itself passing to the north of White Pine Mountain. Once you crest the apex of the pass over White Pine Mountain, it levels out, there are some good spots to camp, some spur roads to follow, and some good opportunities to hike up to nearby ridges. From the top of a ridge near the “top” of Old Flowers Rd. The road itself can be seen below and is the far one. The nearest road in this image is a spur road to a dispersed campsite. The descent into Pingree Valley is short and sweet, and is somewhat steep going downhill. The quality of the road is great, though. Heading down into Pingree Valley. My buddy’s stock Xterra did the whole thing just fine. Once you get to the bottom of the road after going over White Pine Mountain, you will reach an intersection with Monument Gulch Rd., or Forest Road 135. Make a right (turn north) to head to Pingree Park Rd. (County Road 63E) or left to follow Monument Gulch Road. Monument Gulch Rd. goes through to Buckhorn Canyon, but has been closed for several years since the fire. There is also lots of private property along Monument Gulch, so there’s not a whole lot back there anyway. The western terminus of E. Old Flowers. Note: the road is NOT open to OHVs, only highway legal vehicles. Since east and west Old Flowers are not contiguous with one another, you need to follow Pingree Park Rd. north for a few miles to get to the western side. West Old Flowers almost deserves its own post, because it is of such different character from East Old Flowers Road, and isn’t even a contiguous road with the eastern section. Almost nothing west of Pingree Park Rd. was affected by the High Park fire, including the western portion of Old Flowers Rd. The western portion doesn’t go through (unless you’re on foot or horseback), and is much shorter. It ends at the trailhead for Flowers Trail (Forest Trail #939). 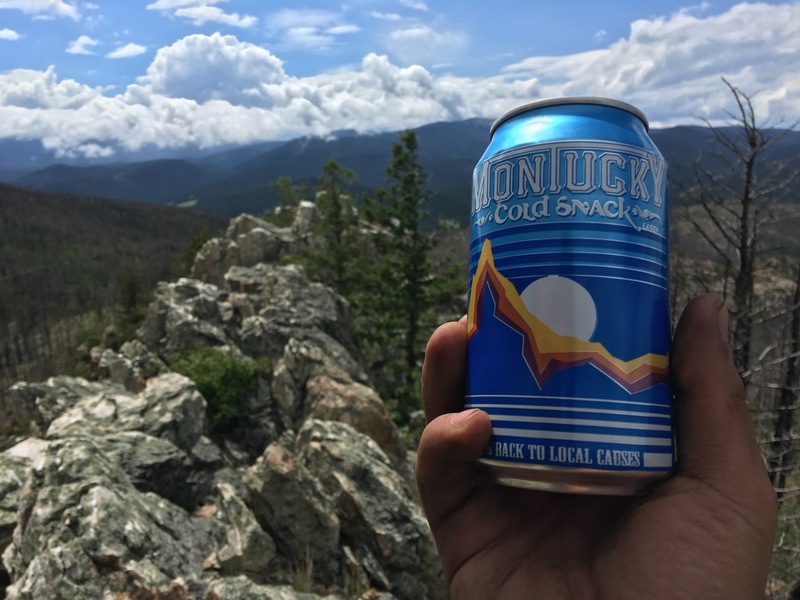 which takes you into the Comanche Peak Wilderness and ultimately drops back down near the headwaters of the Poudre River not far from Cameron Pass (closer to Long Draw Rd., actually). 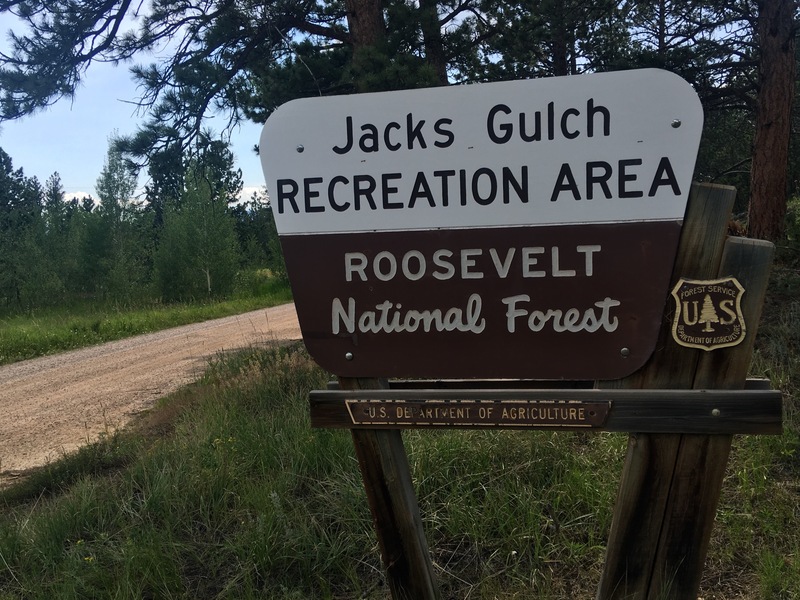 The first thing you’re going to do on W. Old Flowers is pass through Jacks Gulch Recreation Area, a USFS campground maintained by American Land & Leisure. Jacks Gulch is a fee area, so if you’re using any of the campsites, you need to pay at the self-service fee station near the entrance. 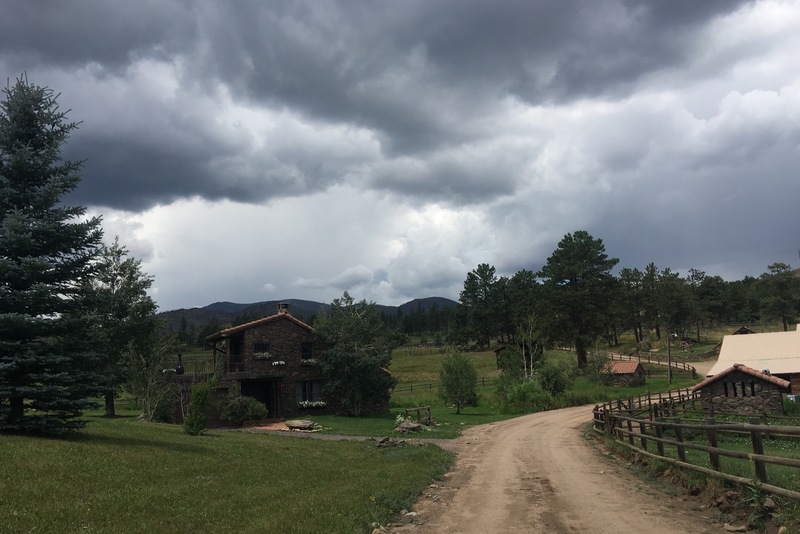 The campground is well-maintained and well-equipped, with water, restrooms, RV sites as well as both hike-in tent sites and ones with parking, and an equestrian loop where those bringing horses can stay. The welcome sign and map for Jacks Gulch. Old Flowers Rd. passes through. There are some little hiking trails in and around the campground. They mainly loop in and out of the tent sites, but ultimately you can get to Little Beaver Creek Trail (FT #948) and back to Flowers Rd. 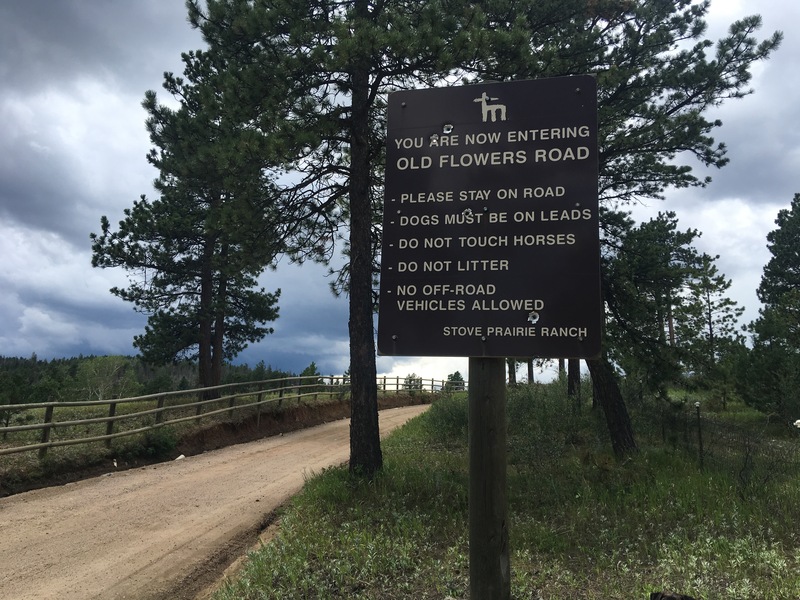 Horses are permitted only on the north side of Jacks Gulch. The south side is for horseless tent campers and RVs. 120V and 240V receptacles. So if you have satellite TV or even internet in your RV, you can be even more spoiled. Jacks Gulch is one of the more well-equipped campgrounds, especially this far from the developed world. There are electrical hookups at a handful of sites. It will cost an additional $10/day to use electricity here. There are pit toilets, and trash service here too. There’s also water. Like the sign says, don’t use this for bathing, dishwashing, or cleaning fish. Fill your water jug then go somewhere else to do that. One of many, many, tent campsites. Continuing on West Old Flowers Rd. West Old Flowers Rd. continues on beyond Jacks Gulch, for a few miles actually. Soon after after leaving Jacks Gulch, you will see the trailhead for Little Beaver Creek trail, or USFS trail #948. Little Beaver Creek actually intersects with Flowers Trail (not the road, the trail), and also provides access to Fish Creek trail (FT #993), another hiking trail in Pingree Park. A marker for Old Flowers Rd. tells you you’re heading in the right direction. Continuing past the trailhead for Little Beaver Creek on W. Old Flowers Rd. will take you three-ish miles to the end of the road, ending at the trailhead for Flowers trail. Old Flowers Rd. used to go through, all the way over the continental divide via Lulu Pass, and drop down into what’s now Grand Lake. The current hiking trail follows roughly this original route, and drops down into what’s now the area of Long Draw Rd. A sign just after the trailhead for Little Beaver Creek gives you the mileage to some other trails in the Pingree/Comanche Peak area. Flowers trail is over 15 miles long and its western end is Big South trail near the headwaters of the Poudre River. From here, the road is a good road overall, with some minor bumpy and rocky sections. This road is a seasonal road, which is closed winters. Normally it closes in December and reopens to vehicle traffic in June. Jacob Flowers is the dude who the road is named after, and who surveyed its original route, so he deserves a shout out. He’s long gone, but was remembered as a loved community figure and family man. As far as bros go, this guy was a true bro. Despite only spending less than a third of his life in Colorado, he made quite the mark. He opened a general store and the first post office, which still stands to this day, in Bellvue, CO. It served as a hotspot community social venue, with hot coffee, snacks, pool and card tables. Flowers added a saloon, a baseball diamond, and picnic grounds in the area. He also built a horse racing track, a grandstand for community gatherings, hosted dog and pony shows, and traveling medicine shows. He built a garden and raised pigs for unfortunate families of quarry workers. He earned the name “Uncle Jacob” because of his altruism and contributions to the community. Sometimes you’re on a road somewhere in the backcountry, and you find yourself thinking, “why in the world is there a road here?”, or “some guy woke up one day and decided, ‘I’m going to build a road over that mountain’.” The industries which built the West are often the reason for why many things exist, why many backcountry roads exist, or why you can find such weird things in the forest. Mining, logging, railroading, shepherding, ranching, homesteading, fire mitigation, are among the once economically dominant sectors that spurred settlement and development in parts previously unknown. George Pingree, for instance, floated timber down the creek and ultimately moved it to Tie Siding, WY to serve the needs of the expanding Union Pacific Railroad. Jacob Flowers’ venues served the many quarries and workers who were working the quarries of the Union Pacific Railroad in Pleasant Valley. Old Flowers Road provided access to timber in the foothills. Old Flowers Road once went through from Bellvue to over the continental divide via Lulu pass. With the closure of the nearby Union Pacific Railroad quarries, and subsequent departure of workers who were once the lifeblood of the economy in the area, the once thriving town of Bellvue was nearly disbanded. Currently, Bellvue is an unincorporated town. Flowers’ store became the local Grange in 1948 and to this day continues to host social gatherings. For all that Mr. Flowers did, his name, and legacy, lives on. More on the life and legacy of Jacob Flowers here. I’m going to be even more philosophical, deep, and cheesy, so deal with it. Hopefully reading the last section made you feel like you were traveling through time. If not, that’s okay because you weren’t (sorry). Old Flowers Road today is nothing special, at first glance. It’s just another forest road which provides great opportunities for camping, hiking, and outdoor recreation. But knowing about its rich history gives it more charm than the run-of-the-mill road. Knowing that the road once went through and over the great continental divide, in a time when modern machinery and surveying didn’t exist, adds to that charm. Knowing that it was one of the very few routes over the divide before the current State Highway 14 was built adds to that charm. Knowing about the man who pioneered it and the legacy he left and lives he affected for the better makes the road all that much more special. A lot of what Old Flowers Rd. represents, to the trained eye, is the importance of stewardship over the land, and the ever-oscillating ebb-and-flow of mankind’s relationship with nature. A testament to mankind’s stewardship of the land. Along W. Old Flowers. See, I’m not some crazy hippie talking about this. I didn’t put this sign here. Certainly enough, nature has its own ebb-and-flow without mankind, and is in a state of constant motion. The elements: air, fire, water, and earth, are all in a state of constant motion, whether it be through timescales of seconds or centuries. Motion of the earth gives rise to springs, providing life. Water carves out magnificent canyons and caverns. Fire destroys life only to enable its recovery, a stronger forest and ecosystem. The Native Americans were more in touch with this than a lot of modern Americans are, but that’s not to say there aren’t those still in touch. Those that are…we are backwoods wanderers. East Old Flowers Rd., over the years, has recovered drastically since the initial burn scar. There are plants regrowing, insects and birds and mammals reigning strong. West Old Flowers Rd. has its own sense of charm, an untouched, yet very touched, environment that exists only in one place in the entire solar system: West Old Flowers Road. Many have come before me, many have seen the same sights and the same beauties I have, but many also haven’t. But the Western United States has many things unique only to it. The red rocks of the Utah Canyon Country exist no where else in the world. The Grand Mesa of Colorado is the largest flat-topped mountain in the world. There are plenty of mountainous environments in the world, to each their own charm and uniqueness. But still, there are one-of-a-kind gems all over the place. This spring has been around for over a century. It served the early ranchers of the area, as well a water source for mule-pack transports along Old Flowers Road back in the day. This is probably the biggest rock you’ll run into on W. Old Flowers Rd. Very passable even if you have a lower-clearance SUV, and there is a line around it to the right. I went over it because I can, and because I wanted this cool picture. Nice little dispersed campsite along W. Old Flowers Rd. If you thought I’m running out of things to keep blathering about with regards to W. Old Flowers Rd., I can keep going. Flowers Trail beyond the end of the road itself (that is the road still open to motor vehicles) has some interesting history of its own. Keep reading to find out. So W. Old Flowers Rd. goes for about three more miles after Jacks Gulch and ends at the trailhead for the present-day Flowers trail, a hiking trail (what did you think it would be called?). Flowers trail is a 15 mile trail that follows much of the original route that Jacob Flowers surveyed. It is now just a hiking trail, and has been since the original road was made obsolete by the construction of State Highway 14. It has been nothing but a hiking trail for decades, but you can still tell parts of it are wide enough for mule-pack and horse traffic, which it was originally designed for (in an age before the automobile). The end of present-day W. Old Flowers Rd. is a parking lot with room for something like five or six vehicles (assuming no one parks dumb). The sign at the trailhead for Flowers Trail #939 with mileage to hiking trails it intersects with. Big South trail is the western terminus of present-day Flowers Trail. Flowers Trail holds many legacies of its own, the most notable being that there is a B-15 crash site about five miles in. The crash site is still accessible, and there is a lot of destroyed metal scrap because the U.S. Army went in and blew it up with dynamite shortly after the crash. It would’ve been too expensive to haul everything off the mountain. But large parts of the wreckage are still there. Parts of the fuselage, the engine, the gunner’s cockpit, and more are still intact. I hiked there a couple years ago and unfortunately don’t have recent pictures. I do have some though. What you’re about to see were all taken with a camera I no longer used. I tried to tone-down the originally overkill HDR. View of the wreckage. Parts of the wings are clearly visible. This was once a fuel tank. Another shot of the wreckage. Of the ten-man crew, only six survived. The pilot, copilot, and gunner were killed instantly in the crash. The tailgunner died from injuries after the crash. Two of the crew members who were able to walk, hiked two miles downhill to Beaver Park, where they met two fishermen who then drove them back in town so they could alert authorities and start a rescue mission for the four remaining survivors. According to reports, before the crash one of the crewmen looked out the window and saw trees going by. The plane was flying at 10,000ft in 11,000ft mountains, and crashed at roughly 10,700ft. A huge factor for why there were so many survivors is because the pilots were able to pull up last minute to hit the mountain at an angle instead of head on. 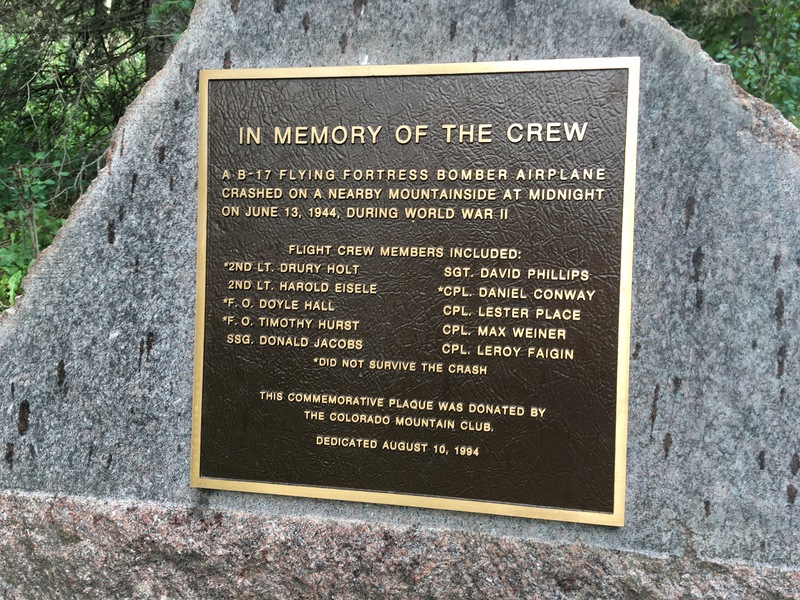 There is a memorial for the crew at the trailhead for Flowers trail. There is a ton of history surrounding Old Flowers Rd. and Flowers trail. The power, and beauty of nature is something which cannot be discounted. Old Flowers Rd. serves as a tribute to what can be accomplished by man, but also how the forces of nature will always and ultimately reign superior. Old Flowers Rd., while nowadays offering recreational opportunities for many, once served a much different purpose. E. Old Flowers can be much more difficult if muddy or wet. I pulled a guy out of the mud last time and he had 4WD. It’s possible to do the entire thing in 2WD if dry (though, some sections are almost always wet/muddy). Be prepared. W. Old Flowers is a much better road, and shorter. E. Old Flowers is a soft road bed in places because of fire and washout damage. W. Old Flowers is almost always dry unless it’s currently raining. There are no creek crossings, unlike E. Old Flowers. It is bumpy and rocky in spots, though.